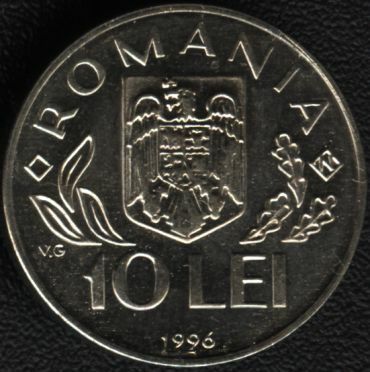 Obverse: ROMANIA, Romanian coat of arms, at left three laurel leaves and one rhombus, at right three oak leaves and one rhombus with a N inside, denomination "10 LEI" and year 1996. Below the left leaves lies V.G. standing for Vasile Gabor, the engraver's name. 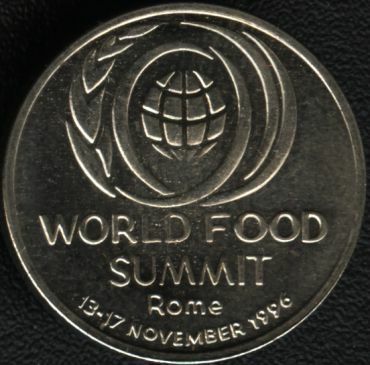 The World Food Summit in Rome in November 1996 was organized by FAO - the Food and Agriculture Organization of the United Nations. The main subject of the reunion of Rome was the fight against hunger. For Romania spoken Mr. Traian Chebeleu, personal reprezentative of the President of Romania, Mr. Ion Iliescu. The letter N inside the rhombus at right is probably connected with the numismatics. Far difficult to understand is why the inscription is in English. If it was in Italian, an explanation might be accepted: the FAO summit took place at Rome.